Apple could potentially reap $3 billion in incremental revenue from Pokémon Go over the next couple of years, an analyst argued in a Wednesday investor memo, helping to buoy the company's stock price. In the memo, seen by AppleInsider, Needham's Laura Martin noted that an earlier casual gaming hit —Candy Crush —generated over $10 billion per year in its peak years, 2013 and 2014. Pokémon Go, however, already has 10 times the number of players, and Apple gets to retain a 30 percent cut of any revenues generated from the iOS App Store, though the game is also available for Android. The game is currently thought to be reaching 21 million people in the U.S., or about 6 percent of the country's population. Assuming global penetration peaks at 20 percent in the markets where Go is available —and Apple pulls in 5 cents per person, per day —the company could theoretically take in an extra $3 billion in revenue in the next 12 to 24 months. 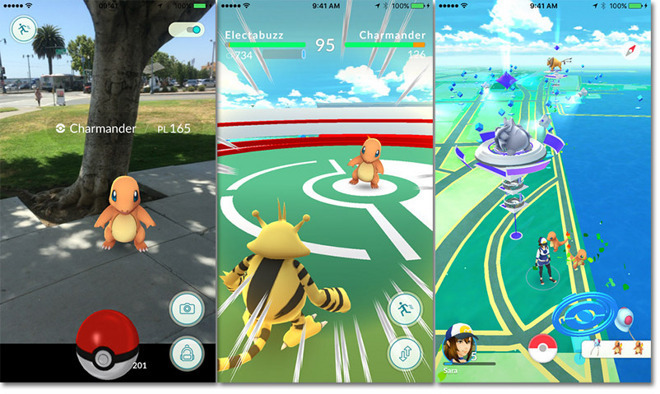 That might boost the company's market cap by as much as $5.5 billion, or $1 per share, Martin added, also pointing out that Apple's short-term cash flow from Pokemon Go is expected to be higher than Nintendo's, which only owns 33 percent of the Pokémon Company along with a 30 percent stake in the game's developer, Niantic. Apple shares have risen slightly in Wednesday trading, sitting just over $100. For most of the past three months, shares have typically sold under that threshold, bottoming out near $90 in May.